The form of energy training that I teach is called ‘rose’ energy. Before you decide to begin any of the courses proper please connect with the energy of the rose to ascertain whether this form of energy training is for you. Close your eyes and relax deeply. Feel yourself drifting in a space of pure delight and joy. Come to a situation where you recognise this space, it might be a favourite spot on the beach, in a forest, near a lake, or in the mountains. Claim it as your special space where you are able to relax and be yourself, enjoying the feeling of being alone and yet in a space which is your own. 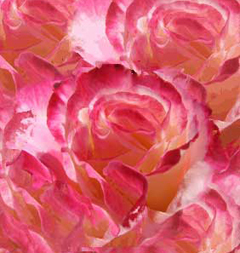 Begin to see a rose, the key symbol of ‘rose’ energy training. Look inside the rose, smell its fragrance, and notice its colour. Move inside the rose and feel again the velvety feeling of being surrounded by the most beautiful coloured petals. In this safe spot ask for inspiration and guidance about what your current influences might be. Awareness is the most important step. Once we are aware we can take the step to set ourselves free. Move slowly out of the centre of the rose and back to your special place. Then gradually return to the present. When you have settled write down the information you have received, or your experiences generally, in the space provided below. Add to these as you return from time to time to renew yourself through this special meditation. Then write down how you can, in practical terms, move on from these limitations. When you have become comfortable and familiar with the rose symbol use your special colour to reinforce your goals and aspirations tuning in to the rose, as you feel is or to be appropriate. And remember, as this process begins to work effectively, say thank you to the universe for guiding and supporting you and helping you to tune in so effectively. PLEASE REMEMBER THAT BEFORE, DURING AND AFTER A COURSE SUCH AS ROSE REIKI YOU MAY EXPERIENCE SOME CLEANING AND CLEANSING IN YOUR LIFE. IT IS IMPORTANT TO HONOUR YOUR ENERGY AND TO RELAX. TAKE UP YOGA OR TAI CHI. HAVE A MASSAGE. UNDERSTAND THE NATURE AND EXTENT OF THE ENERGY THAT IS NOW BEGINNING TO REACH YOU. The Brothers and Sisters of the Rose were the traditional carriers or owners of the ‘rose’ energy, which is a strong contributor to the form of Reiki that I teach. They have held the energy in a sacred trust for us for centuries and the fact that it is now time to reveal it in its full form is exciting. Usually a person comes to learn Rose Reiki when he or she is ready to receive his or her spiritual inheritance. As you connect with the energy, you may indeed feel a chord like a struck bell inside yourself as you resonate on an even higher level.